Visit us on Facebook for regular updates on the progress of our campaign and to find out news from other companies and organisations keen to support colour blind people. For more information click on Post below and this will take you to our Facebook post and a link to our short survey. Post by Colour Blind Awareness Organisation. People with colour blindness, your future is looking brighter! Don’t miss your chance to be involved in our exciting research! If you would like to take part in the trials, Spectral Edge will meet your travel costs (within Greater London) and pay you £20 in addition as a thank you for your time. The tests will take approximately 1½ hours per person. Testing will commence from mid-November 2014 and we will accept people 12 and over, although under 18s must be accompanied by an adult (travel costs for 1 adult only can be refunded). Please contact us at info@colourblindawareness.org to register your interest. 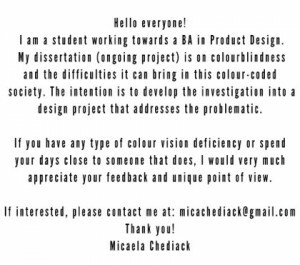 Students at the University of Dundee are currently running 2 projects and need colour blind volunteers – see below for more information. My name is Daniel Herron and I work at the School of Computing at the University of Dundee. I will be running a study at the University in the coming weeks that aims to develop an online colour perception categorisation tool. I am looking for participants with Colour Vision Deficiency (CVD) that are aged 18+ to come in and take part in a colour blindness categorisation test. This will help me to build models of different types of colour perception and contribute to the development of this online tool. For more information about the study or to register to take part, please go to http://cpestudy.computing.dundee.ac.uk or email me at danielherron@computing.dundee.ac.uk. Thanks! 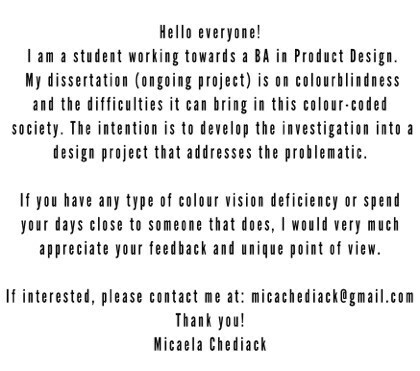 Participants needed for study in Colour Vision Deficiency study! Are you a resident of Dundee who has some form of colour blindness? Do you and a member of you family who has normal colour vision have 1 hour to spare to take part in a study designed to develop technology that will give people with normal colour vision a greater understanding of how people with CVD see the world? If so then please contact University of Dundee Masters student Alistair Gilchrist by email a.z.gilchrist@dundee.ac.uk or by mobile 07854 969 305 for more information and to arrange a time and date. 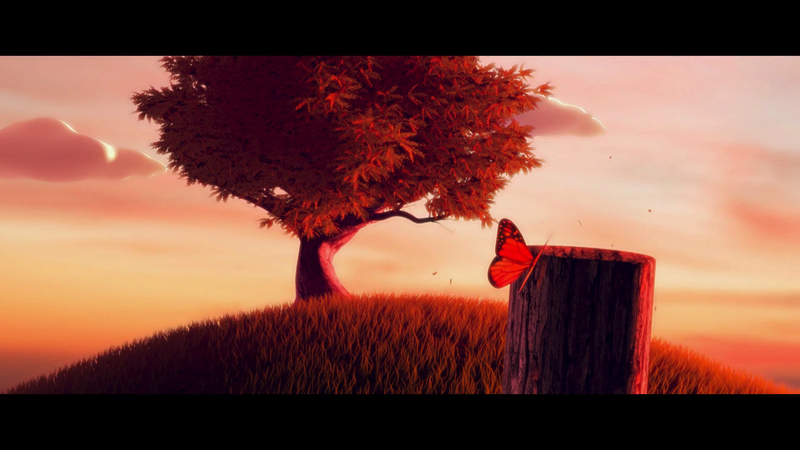 You might like to take a look at this interesting and clever short film by Joav Brill which is his own personal story about living with colour blindness, which we have recently come across. Parents of colour blind children and nursery/pre-school teachers might want to try to watch Chuggington Series 2 Episode 8 ‘Hoot vs Toot’ on BBC iPlayer which is repeated regularly and is a pre-school animated TV programme about trains. Hoot and Toot are brother (Hoot) and sister (Toot) double-ended ‘trainee’ engines. Episode 8 describes what happens when the engines reverse their normal roles and Hoot, who is red/green colour blind, makes lots of delivery mistakes because he can’t see the difference between red and green. This episode is fantastic for helping to explain to colour blind children that there are plenty of other colour blind children in the world so they are not alone. Siblings and classmates can also appreciate the need to be understanding of others who are colour blind. BBC One’s The One Show is due to air an item about colour blindness in the programme on 21st June . The item will include a film about a colour blind girl and the difficulties she faces in everyday life which arise because of her colour blindness. Visit the Ordnance Survey’s website www.ordnancesurvey.co.uk for information about their recently launched online colour blind friendly maps. Ordnnace Survey advise they they are working towards being able to provide all of their different types of map format in colour blind friendly versions as soon as possible. Colour Blind Volunteers Urgently Needed – Can You Help? City University is conducting research into how colour blind users interact with gaming environments. The researchers aim to ensure the results of the study will help create an awareness in gaming circles of the needs of the colour blind. All types of colour blind people are eligible to take part. and volunteers are needed as soon as possible, preferably by the second week of February 2011. If you are over 18 and are willing to give half an hour of your time at the University to test 2 games and answer a short questionnaire, please respond to info@colourblindawareness.org and we will put you in touch with the research team.